National Small Business Week is being held May 1-7, but we're continuing the celebration throughout the month of May, discussing small businesses and the crucial role they all play in the success of our thriving local communities. Join us as we cover best practices, next steps toward success and the challenges small businesses face (as well as how to overcome them). If you're a small business owner or dream of one day following your entrepreneurial dreams, you don't want to miss this month-long series of useful content and tools for success. Small business owners are getting involved within their local communities more than ever. It’s a key factor that larger corporations try to emulate in an attempt to connect on a local level, but that fact that nonprofits generally receive 250% more from small business owners than large conglomerates proves that it’s just not the same. Small business owners have an advantage in highlighting this key difference of community involvement that sets them apart from transplant corporations. The best way to make the most of your community program relationship is to understand your own business goals and how to pick the right program to align with those for mutual success and benefit. Unfortunately your business can’t give to every program that’s looking for support from local leaders. Spreading your dollars thinly across multiple programs won’t benefit the organization, or make the most impact with your available funds. Aside from the business benefits, it is extremely important to have a genuine connection to the cause your small business is supporting. Honesty must be the key factor motivating your company’s support in order for your consumers to trust the investment and receive it as a humanizing act of transparency versus a tactic for operational gain. Once you have your goals and budget aligned, it’s time to start picking the right local program to support. Some might be specific to the area, or others may be a local version of a generalized issue or larger campaign/organization. 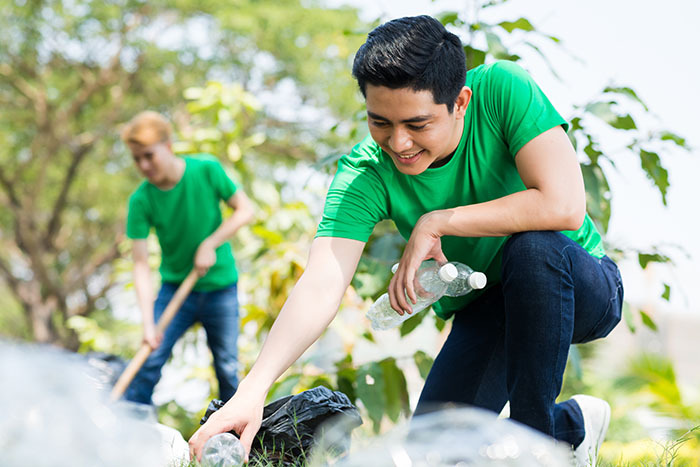 For instance, if you’re a small business owner in Melbourne that passionately cares about the environment, supporting a program dedicated to beach clean ups can add a personal connection. Speak with your staff to discern if you and your team have any common connections or passions for a particular organization or theme. The impact your company’s contribution has will live or die by the support of your team, so make sure they’re just as excited as you are to take part in the cause you choose. The University of Bath reported that on average, employees experience more job satisfaction and loyalty to employers that take part in community initiatives. Another survey by Rutgers University also found that 65% of student respondents entering the job market today expect to make a social and environmental impact through their work, and 44% indicated they would be willing to make less money if service to the community is one of the job perks. The deeper the personal connection, the more likely you are to have found the perfect organization for your business to support. However, the decision making process doesn’t stop there. When there are multiple local programs that serve to improve that cause/ issue there are a few factors to help you decide which is the best fit. Just like the cause itself, the community program’s actions should also be relevant to your business’s reasons for getting involved. Every community program is a little different, and those differences will highlight their margin of relevancy. For instance Lynx Construction Management in South Florida values restoration projects that bridge the community’s past, present, and future. This brand message is further supported through the desire to create a similar bridge between those in need in the area to those with financial opportunity. Therefore, their program involvement is hyper focused on nonprofit efforts targeting children of low income families as a means of building a strong foundation for the area’s future. The amount of time and financial support you have available to give as a company is an important factor to take into account, as well. How much you have to give of both valuable resources could mean the difference between supporting a little league team by buying them uniforms or simply making an occasional donation each year, or undertaking organizing an event or taking part in large-scale community service projects as a team. Most organizations will gratefully accept any level of help, but can also suggest the best mutually beneficial options for your investment once you both have an understanding of the relationship scale. The reputation of the organization your team is getting involved in is incredibly important no matter what business goals you may have. Always pick a reputable program with the appropriate permits needed for their business. You are choosing to align your name and reputation with theirs once you enter into a partnership or call attention to your support of their organization, so be sure their reputation will build yours up – not tear it down. If the program is new, it is especially important to gather as much information as possible on their background and how your contribution will be spent. Plus, don’t hesitate to ask for proof of your contribution’s impact since this information can help you share the mark your small business is making locally. and less than 46% feel they are receiving enough details about those results. Another tip when considering the organization’s reputation is to keep your own small business’s products or services in mind as well. Partnering with a reputable program can bolster the reach and reputation of your own products and services, especially when there is synergy that makes sense for both parties. At least 59% of Americans admitted in the 2010 Cone Study that they are more likely to buy a product associated with a business-nonprofit partnership, and 78% of Americans agree that they pay attention to the product or service more specifically because of the relationship. Rather than simply giving donations and signage or handing over a check, consider opportunities that may allow the program’s staff or those being serviced through the organization to utilize your product or service. This can help to support proof of concept for new items your business offers, or grow exposure for new or less popular products or services you offer. Gaining exposure to a strategically desired audience is very important when choosing the best program to partner with for your community involvement. The demographic of their contributors and those who they serve should be another primary factor in your decision making process. One tip to keep in mind when analyzing an organization from this aspect is to remember that a larger reach doesn’t always mean a better reach. If one organization is already receiving a lot of support from the community, then sometimes going with an organization with a smaller reach can actually provide a bigger depth of impact to the affected area as a partner, and for your goals for the partnership since that organization and relationship isn’t as saturated in the marketplace. The point of choosing a service-based partner is to build a deeper and stronger relationship with your local community by addressing a need. The more your dollars are able to help serve those in needs, the greater your return on the investment will be. As a small business owner, you know better than anyone that a company’s size does not always reflect its value or full potential. There are multiple organizations that need support to help others in the area and the list below is just a sampling to help you begin your own search and discovery of the best fit for your business. Some are local chapters of national organizations, while others sprouted up on their own to service a growing need in the area. Keep in mind the goal of your giving vision, and contact the local office to find out how your business can get involved. The United Way of Florida – The 32 United Way organizations throughout Florida work to improve the lives of individuals and families and build strong communities by uniting people and organizations to create measurable results and a lasting impact.The mission of the United Way of Florida is to enhance Florida United Ways’ efforts to increase the organized capacity of people to care for one another. Involvement with the United Way would allow wide variety of involvement levels and styles from simple monetary donations to hosting food drives for your community members in need and much more. The YMCA – The YMCA is a religious-based organization that offers wellness and health resources to the community, and is known for its youth development programs. The YMCA’s mission is to put Christian principles into practice through programs that help healthy spirit, mind and body for all. The Central Florida Community Arts - Getting involved in the local Central Florida arts is easier than ever. Outside of supporting the program through ad space and service donations, it’s also a great idea to get one of the local community groups involved in your company’s next marketing event. Featuring local art/artists also has the potential to increase your attendance rate by 49% since your event is supporting a local program, according to studies. The gift of exposure can provide an entertaining evening for your guests, while also improving your brand’s reputation and opening you up to new audience opportunities. Space Coast Science Education Alliance – Organizations like the Space Coast Science Education Alliance support STEM programs for students and award innovation within the local community. There are many opportunities to sponsor awards, scholarships, and much more to advance the innovative tech culture developing within a local setting. If you're interested in launching a new business or have questions about your existing small business operation or want to learn more about the importance of getting involved in the community and the best way to go about it, there's no better place to find expertise and guidance than from a seasoned small business owner, banker and professional -Don't miss your opportunity to ask Seacoast's Executive Vice President, Small Business Banking Leader, Julie Kleffel any question you'd like about small business in the form below. Also be sure to check out our small business banking solutions. AND mark your calendars for May 31st at 12pm EST, as Julie hosts a #SeacoastSmallBiz Twitter Chat with Seacoast Bank(@SeacoastBankCom) to provide insight on her own experiences as a successful small business owner, mentor and lender, and dive deeper into how to launch, nurture and grow successful small businesses in the state of Florida. Julie Kleffel is Seacoast Bank's EVP, Small Business Banking Leader. She joined the Seacoast leadership team as a result of a merger between her former institution BankFIRST and Seacoast Bank. She is responsible for developing, implementing and overseeing the bank's small business banking strategies and initatives statewide. Prior to the merger, Julie was BankFIRST’s Executive Vice President and Commercial Sales Leader. She has over 19 years of overall banking experience, plus was a successful entrepreneur, having owned and sold four small businesses. As a fourth generation Central Florida native Ms. Kleffel has strong ties in the community. Ms. Kleffel currently serves as the Treasurer for the Garden Theatre, Executive Board Member for the Dr. Phillips YMCA, Finance Committee for the Central Florida YMCA, and Executive Director for the National Entrepreneur Center. She is a Lifetime Director for the West Orange County Chamber of Commerce. Previously she served as the Past President for the West Orange Committee 101, Past Chairman of the Roper YMCA, Past for Oakland Park Foundation Board, and Past Advisory Board Member for Westside VoTech. She is a graduate of Leadership West Orange. A graduate of the ABA National and Graduate Commercial Lending Schools, Ms. Kleffel has also received the prestigious “Certified Lender Business Banker” designation from the Institute of Certified Bankers. She completed her professional education by graduating with distinction from the American Bankers Association Stonier Graduate School of Banking at the Wharton School of Business at the University of Pennsylvania in 2009. Her graduate Capstone Strategic Project was published by the ABA immediately following her graduation. She has served as an Advisor and Advocate for the school since 2009.